The dried, powdered dates in this body scrub exfoliate gently, leaving the skin smooth and glowing. Use about once a week in the shower. It is best to start with damp or slightly wet skin. Apply a small amount, then gently rub on legs, feet, back or arms. It leaves the skin soft, smooth and radiant. This is an emulsified cleansing body scrub. The natural oils, butters and the dates will not separate, so there is no need to stir before use. That means that once you rinse off, it will not leave your skin oily or greasy as it rinses off easily. Help polish you skin to perfection! Avoid contact with eyes. 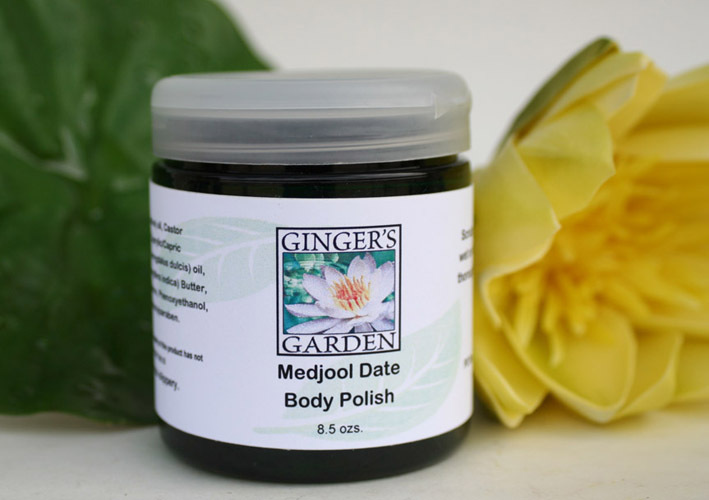 Date body polish contains no parabens or SLS. Comes in a pretty green jar with easy to use flip top. DATE POWDER gently scrubs away dry skin cells leaving your skin refreshed and gently exfoliated. It is a gentle abrasive which helps reveal more beautiful skin. RICE BRAN OIL is a light moisturizing oil for silky smooth skin. It is very hydrating and rich in antioxidants and tocotrienols which is vitamin E.
CASTOR OIL is highly emollient and also has Vitamin E. It contains triglyceride which makes it an ideal natural ingredient in skin and body care. MANGO BUTTER is a soft solid emollient which helps add moisture and hydration to the skin. It has skin softening properties. It is food for your skin as it contains natural moisturizing and antioxidant properties. It is suitable for any type of skin. ALMOND OIL is a lightweight oil and the skin's best friend! It moisturizes lightly and contains fatty acids, magnesium and Vitamin E. The use of almond oil dates back to the time of Egyptians where it was used as a moisturizing, conditioning and nourishing oil for skin and hair care.